This may become the ultimate tribute to jazz singer, Julie London (1926-2000). 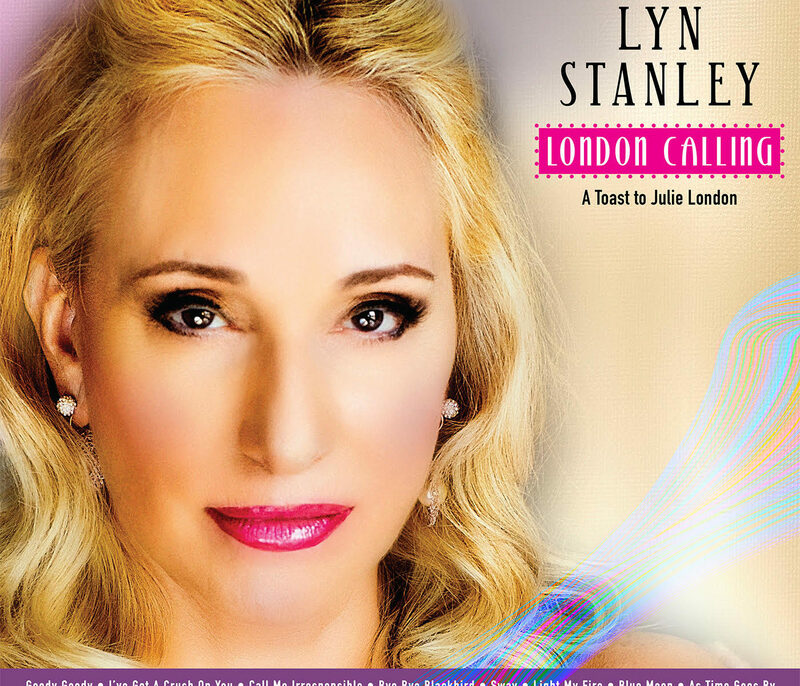 Lyn Stanley selected 15 of Julie’s loved covers and brought them back to life with re-imagined arrangements created by Lyn and her band. 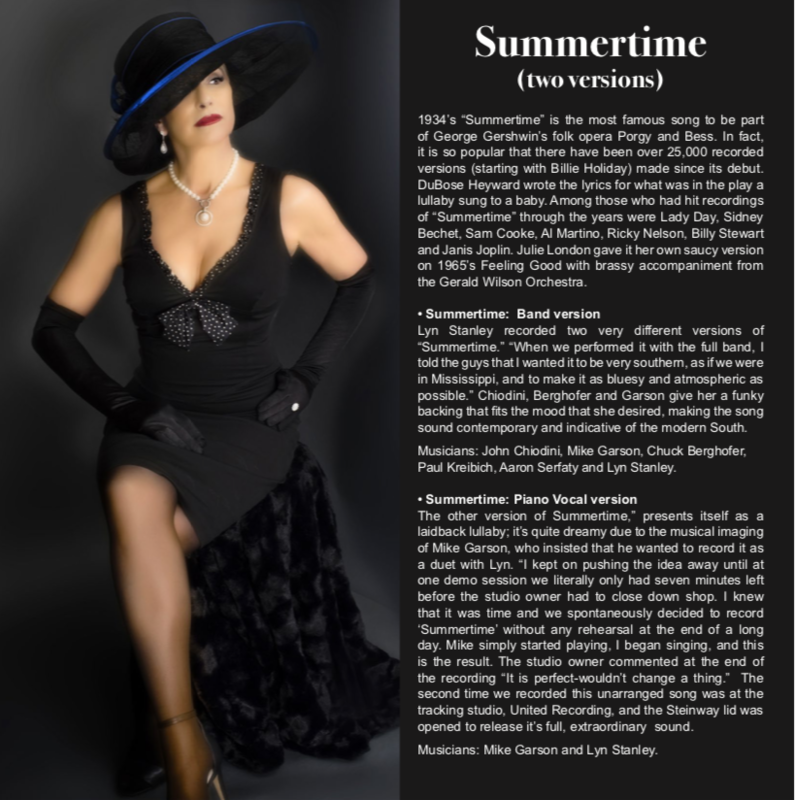 Never intending to mimic Julie London, instead, sultry singer Lyn Stanley favors a tribute that honors some of Julie’s prefered styles of performing her songs. Namely, use of guitar and bass players whenever possible. Selection of songs with a simple relaxed style that accentuates the lyrics and note choices over scatting as an instrument. Method acting the roles portrayed in the lyrics was the goal of both Lyn and Julie enhanced by the perfect musical accompaniments to set the song moods. Engineers/Studio: album was recorded live at United Recording in Hollywood, CA, the studio believed to be the one Julie London also recorded some of her albums. 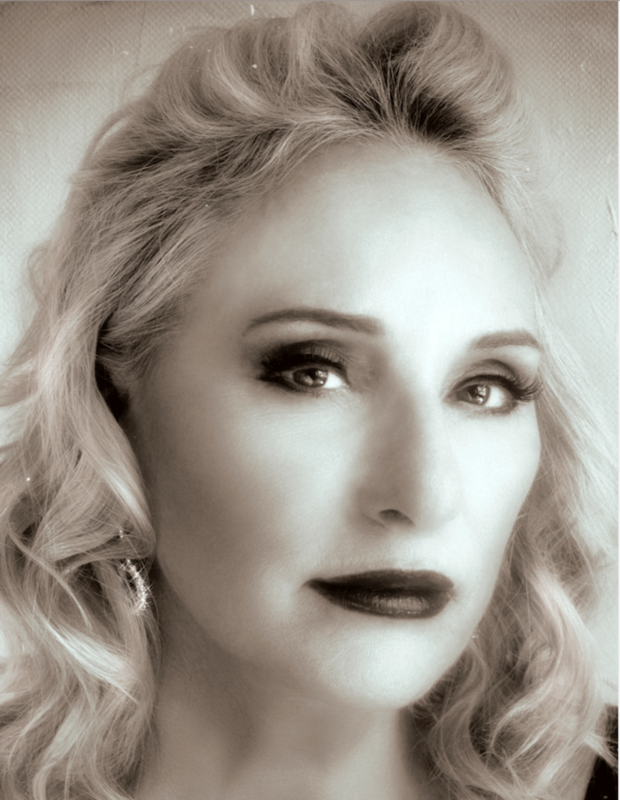 Included in Lyn Stanley’s album is bassist Chuck Berghofer who at the age of 19 began playing in live performances for six years with Julie London and her pianist husband, Bobby Troup. Chuck and Lyn perform a bass vocal duet in this album as London did with another of her bass players, Don Bagley. Added to this album are two songs Julie London did not cover, but were popular during her recording years. 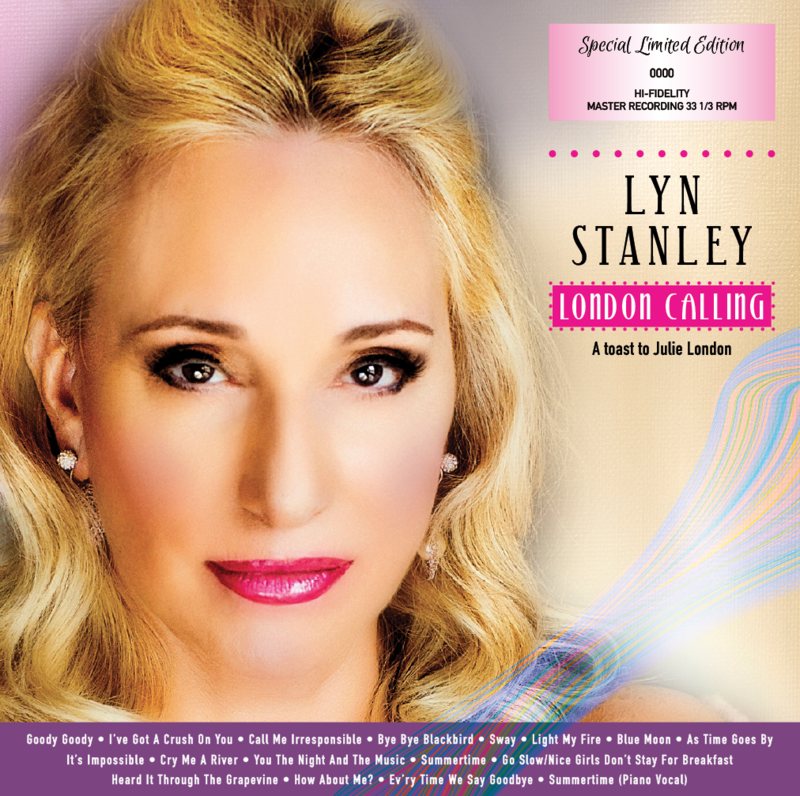 Lyn Stanley envisioned new musical ideas around the songs, I Heard It Through The Grapevine and It’s Impossible, and with the help of her band created unique and memorable new renditions of these mid-century popular tunes. Analog mixed and mastered, this recording was tracked and mixed through the Focusrite console in Studio A at United Recording. It is one of only ten consoles ever created by it’s British manufacturer. Tracking engineer, Steve Genewick, lead engineer at Capitol Recording Studios and Grammy award winning engineer, Allen Sides of Ocean Way Audio did the mixing. Mastering performed by Bernie Grundman of Bernie Grundman Mastering. One song (It’s Impossible) was tracked at LAFx, Los Angeles, CA. One hour and eight minutes of music on four discs, 33 1/3RPM double album in standard vinyl weight pressed by Record Technology, Inc.
Song list: Goody Goody, Call Me Irresponsible, Bye Bye Blackbird, I Heard It Through The Grapevine (bonus), How About Me? Cry Me A River, As Time Goes By, Summertime (band version), It’s Impossible (bonus), Blue Moon, I’ve Got A Crush On You, Light My Fire, Sway, Go Slow/Nice Girls Don’t Stay For Breakfast, You The Night And The Music, Ev’ry Time We Say Goodbye, Summertime (piano/vocal). Musicians: All vocals: Lyn Stanley, Featured Guitar: John Chiodini; Piano: Mike Garson and Christian Jacob; Bass: Chuck Berghofer and Mike Valerio; Drums: Paul Kreibich and Aaron Serfaty; Percussion: Aaron Serfaty, Luis Conte and Brad Dutz.